Explore the intoxicatingly haunted side of the New Orleans French Quarter with this two hour Haunted Pub Crawl led by a local licensed guide. 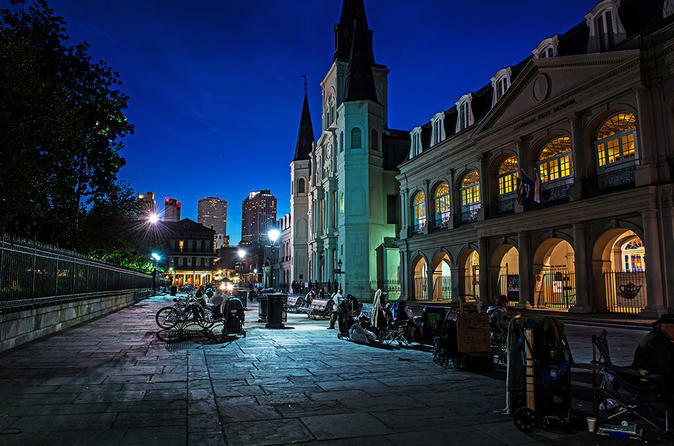 Learn about real haunted ghost stories at haunted locations throughout the French Quarter which have been verified by historical research done at each property. This tour is all about fun and we make sure to stop by the best haunted bar locations in the city. You will have time to get drinks along the way at one or more of these stops. You must be 21 years of age to go on this tour. Your first drink at Tujaques is on us! Make your way to Tujaques to meet your local licensed guide and to grab your included cocktail. Your guide will be waiting for you just outside the bar at Tujaques. Please bring you confirmation email with you so that your guide can check you in. The tour visits haunted places like the infamous Lalaurie Mansion (as seen on 'American Horror Story Coven'), May Bailey's Brothel (as seen on Travel Channels 'Ghost Adventures'), and many other sites such as the 'Sultan's Palace' or Lafitte's Blacksmith shop. The tour is alcohol friendly (feel free to bring a drink with you), and is a 2-hour leisurely stroll just under a mile long with frequent bar stops and restroom breaks.